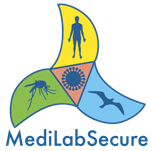 Please find here a list of events that might interest MediLabSecure partners. If you want your event to be listed here, please send us an email. Thank you! Dates: 9 May - 10 June 2016: 5-week internet-based module offered in a coursera.org-site. 16 - 23 August 2016 (both days included): 1-week on campus course at the Frederiksberg Campus of UCPH- Copenhagen.